Thank you for your support for our “Faith to Ford” campaign to protect our Clean Cars and fuel efficiency standards, which are under attack by the current administration, the automakers, and Big Oil. The current Clean Car Standards are set to nearly double fuel efficiency by 2025, and are the single most significant global warming policy we have on the books. But the auto industry wants to slow the drive to cleaner, more efficient, hybrid and electric vehicles, just when they are most needed. 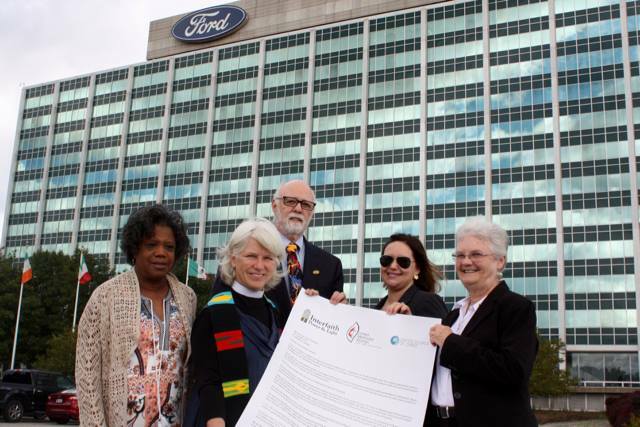 4,000 people of faith signed a petition to Ford a couple of months ago, calling on them to reverse course and stand by the Clean Car Standards. That was delivered in the form of an 11-foot long scroll to Ford Headquarters in Dearborn, MI. Now, we want to take this message to the Ford dealers. Would you like to join with others in your local community in this effort deliver our petitions to Ford dealers? Would you like to organize a delivery or join a planned delivery? Click the button below to sign up and get access to contact information. Your email information will not be viewable on the public website. Only people who sign up will have access to emails of volunteers and organizers. Here is a list of current events and interested volunteers. If you would like to join a current event or do not see your state and want to organize one, please click the button above to sign up. I would be willing to meet with a group of folks to plan a delivery. I am a UMW and it would be great to meet UMW, IPL or UCC to take the petition to dealerships in our geographical area. United Methodist Women's national board of directors and program advisers will be organizing a delivery with IPL March 28, 2019 most likely at the Wyatt Johnson Ford in Nashville. As a Be.Just.Be Green, a Western Jurisdictional coordinator of the environmental justice advocacy group of the United Methodist Woman, I would like to form a group of like-minded people in this area(Southeast of Denver) to deliver the petition together. I am on the Board of PA IPL and we already did one delivery, in State College in December. If we can recruit some more people we would like to try a delivery in Blair or Huntingdon county at one of these dealers. We would welcome involvement from UMW or UCC members. I would like to join a delivery group in the Bay Area. We will be going to Sunrise Ford on Thursday or Friday, February 7 or 8, to deliver the Ford petition, including the signatures of local supporters, and speak with the General Manager about our faith principles. A news advisory and press release will be sent. If you have not signed the petition yet, you can still add your name to be on scroll delivered to Ford dealers across the country.